When considering alternative investments to diversify away from stock and bond risk within an investor’s portfolio, trend-following managed futures is often the first to be added to the portfolio. This is likely due to trend-following managed futures’ intuitive design, lack of correlation to other asset classes over the long-run, and availability of trend-following mutual funds to choose from. However, the search for additional sources of uncorrelated returns shouldn’t stop once an investor adds trend-following to his or her portfolio. Of the many unique strategies that fall into the alternative investments category, one stands out from the pack as the best strategy to pair with trend-following managed futures exposure within your portfolio: short-term counter-trend trading strategies. Short-term counter-trend (“STCT” or sometimes simply “counter-trend”) refers to a trading strategy that attempts to place short duration trades that anticipate a reversal in the price of the security. Counter-trend has a few notable similarities to trend-following, primarily with respect to its structure, persistence, and pervasiveness, making it potentially more suitable to investors who are already comfortable with the trend-following managed futures structure. For instance, counter-trend also uses technical analysis signals to systematically capitalize on the investors’ tendencies to act irrationally. Through technical analysis, it can apply these momentum indicators to the price movements of any index or security with liquid futures markets, and has the ability to go long and short to profit during both appreciating and depreciating periods for the underlying securities. On the other hand, there are a few aspects of counter-trend trading strategies that stand out as quite unique –potentially perfect for pairing with trend-following. By definition, counter-trend has the biggest opportunity to benefit when prices deviate significantly from the trend. Counter-trend strategies often have the strongest performance during noisy, choppy environments; these environments provide the most chances for placing many short duration trades that aim to capitalize on prices reverting to the mean in the short-term. The following side-by-side comparison further illustrates why short-term counter-trend trading strategies are often a great complement to a long-term trend-following managed futures strategy. To better understand how counter-trend strategies work and the opportunity set during various market environments, we will take a look at the statistical concepts of noise and volatility. Counter-trend tends to perform well during periods of high noise in the market, and the amount of price volatility during those periods has the ability to amplify those opportunities. 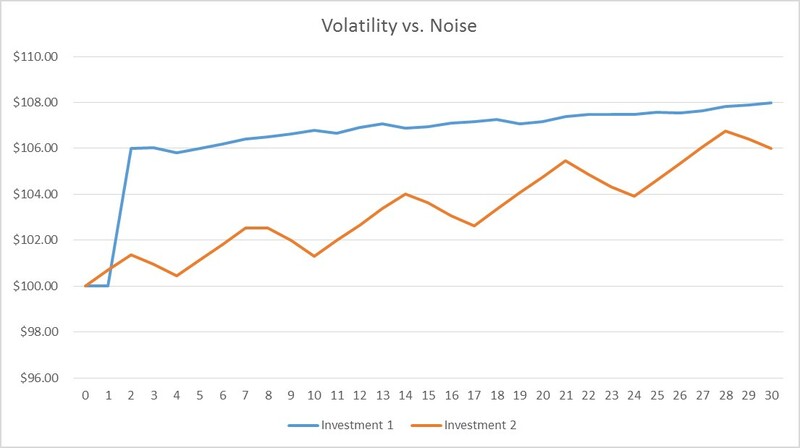 Noise and volatility are two distinct concepts that are often lumped together into one category, but there are some very important distinctions between the two that are worth noting. To illustrate this point, take a look at the following comparison between two hypothetical securities and consider which you think shows relatively higher noise and which one shows relatively higher volatility. It’s pretty widely accepted that equities do well during low volatility environments, but volatility isn’t such a clear indicator of performance for counter-trend strategies. 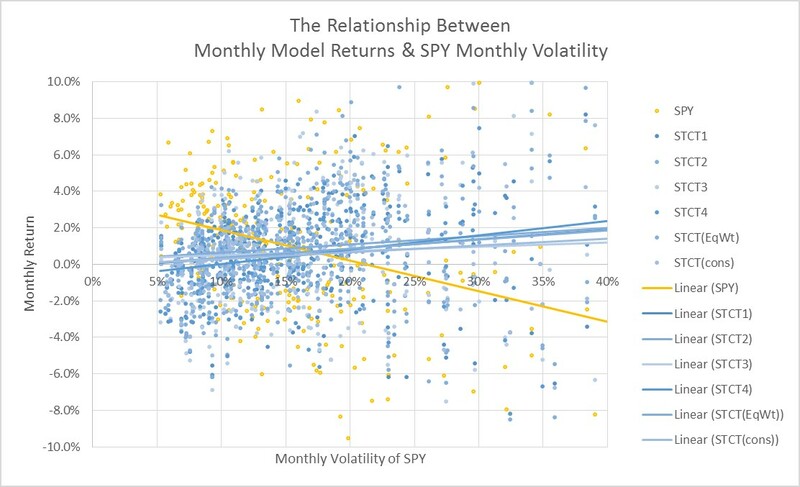 For instance, looking at the following graph that plots monthly performance against the monthly volatility of SPY since inception, it’s clear by looking at the yellow line that SPY has an inverse relationship with volatility. On the other hand, monthly performance of the six different short-term counter-trend strategies (detailed in my previous blog post) appear to have a slight positive relationship with the volatility of SPY, seen by the slightly upward sloping blue regression lines. This slightly positive relationship actually makes sense, because short-term counter-trend is expected to be profitable over long time horizons and the profitability of trades are expected to increase as volatility increases. One thing to note for the relationship between short-term counter-trend models and volatility is how it affects the distribution of monthly returns. Let’s take a look at how the distribution of returns varies for the STCT(EqWt) model, since it represents a combination of four unique trading strategies and should be a good representation of how short-term counter-trend strategies perform during various volatility environments. Although it was already noted in the previous graph that there’s a slight positive correlation with average returns and volatility, the more notable aspect in my opinion is how the distribution expands in both directions as volatility increases. It’s great to see that the maximum monthly return increases with more volatility, but it’s almost equally concerning how the downside risk increases as volatility increases. Over shorter time horizons, there’s serious potential for counter-trend strategies to experience massive swings in performance during periods of elevated volatility. 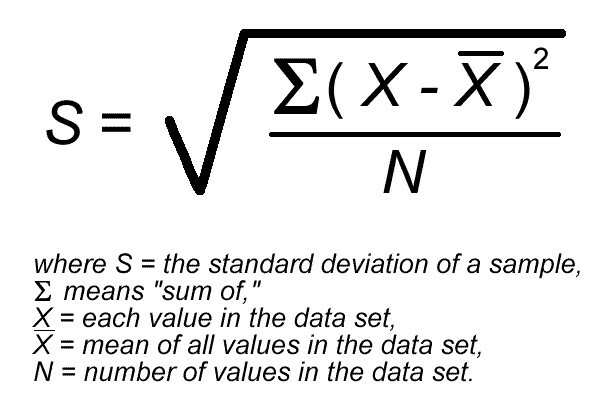 Applying this noise formula to the daily returns of Investment 1 and Investment 2, the resulting noise statistics are 15.6% and 65.6%, respectively. With that in mind, we can see that Investment 2 experienced a lot of noise over the thirty days, because it had a very bumpy path to get from $100 on day 0 to $106 on day 30. Although Investment 1 jumped up rapidly on day 2, there wasn’t nearly as many unnecessary bounces up or down on its path from $100 to $108. For those who are visually oriented, picture stretching out the blue & orange lines and placing them next to each other. The orange line would be about twice as long as the blue line, because all the additional noise in the price movement of Investment 2 produces an investment return profile similar to an accordion or slinky. Since noise statistic is used to indicate how much of the security’s movement can be attributable to noise, it makes sense that the range of the noise statistic can fall anywhere between 0% and 100%. If investors tend to regularly overshoot and then overcorrect the price of a security, relative to the intrinsic value, this scenario would be characterized as fairly inefficient and full of noise. The price movements of the security in this example would have a high noise statistic close to 100%, meaning that a significant portion of the price movement during the period was due to noise. On the other hand, if investors only have a few number of small price corrections during the period, the vast majority of the price movements would not be attributable to noise, and the noise statistic would be much closer to 0%. 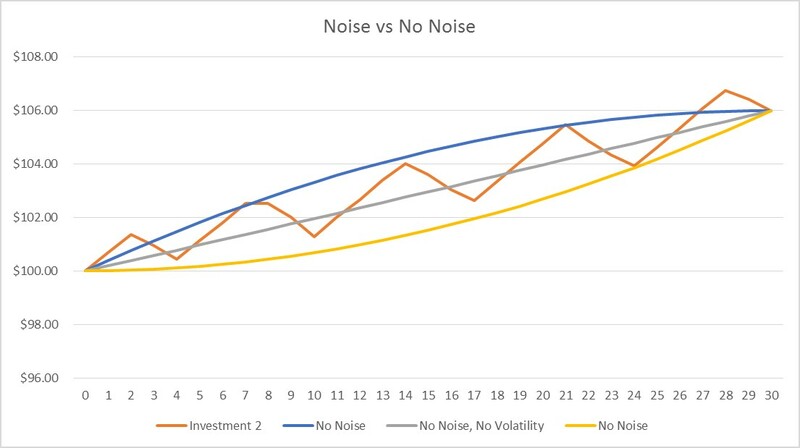 To help crystallize the concept of noise, consider what an investment might look like if there was no noise (effectively no uncertainty) during a given period. A noise statistic of 0% could only occur if there are no instances of drawdowns, assuming the investment had a positive return over the selected timeframe. For instance, if we wanted to remove all the noise from Investment 2, we could literally use any combination of investment returns as long as every day had a positive return and it ended at $106 on day 30. It doesn’t matter whether the investment starts out slowly with low returns initially (seen in the yellow line below), or if it starts out quickly with high returns early in the period (seen in the blue line below; also similar to Investment 1 in a sense); the noise statistic depends entirely on the choppiness of the path taken. Relating back to the formula for noise, it makes sense that noise can only occur with both back and forth price action, because otherwise the Net Directional Movement and the Total Movement will always be the same if the daily value of the investment only increases over time. 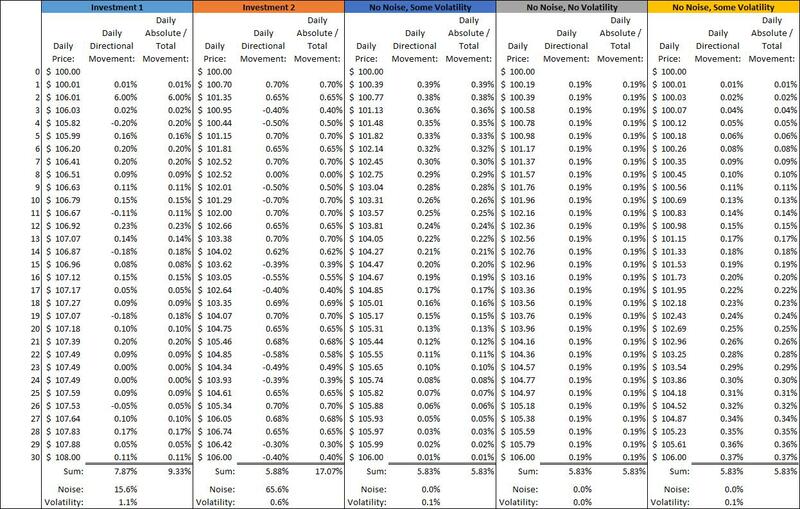 For those who enjoy digging deeper into the numbers to better understand the concept of noise, please see the following Excel spreadsheet, which shows the numbers used for calculating both the noise statistic and the volatility for Investment 1, Investment 2, and the other three return stream examples seen in the previous graph. With a good understanding of the noise statistic, let’s take a look at the relationship between noise and the performance of both the S&P 500 and counter-trend strategies. Similar to volatility, SPY has a strong negative relationship with returns and noise. 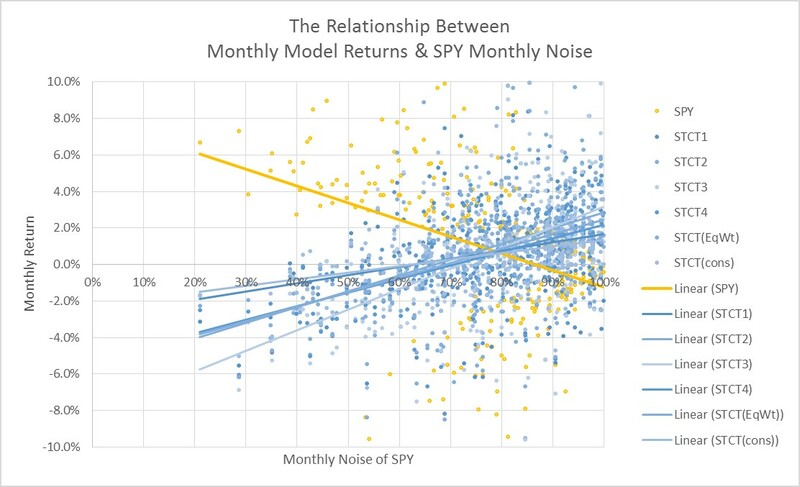 Seen in the graph below, which plots monthly performance against the monthly noise of SPY since inception, the yellow line shows a tendency for more positive returns during low noise environments and relatively more negative returns during months with high noise. It’s an interesting coincidence that all the trend lines appear to cross the x-axis at approximately 80% noise, though the blue lines for short-term counter-trend strategies tend to show the mirror opposite relationship that noise has with SPY. Counter-trend strategies usually struggle with negative returns during low noise environments, but thrive during high noise environments. Taking a slightly different look at the distribution of monthly returns for counter-trend strategies during various noise environments tells another unique story as well. Not only is there the clear story of positive returns for counter-trend during periods of high noise, but each distribution of monthly returns for the various increasing noise groups appears to shift upward. As noise increases, there tend to be higher highs and less extreme lows. Unlike volatility’s less biased effects on the distributions of returns for counter-trend strategies, higher noise appears to increase upside risk while decreasing downside risk at the same time. Calculating the monthly noise statistic for the S&P 500 since 1950 helps to give a good visual representation of the tendency for relatively high noise on a regular basis. The following is the scatterplot of all monthly noise statistics from 1/1/1950 through 12/31/2016, which shows not only how the monthly noise statistics tend to fall primarily above 50% for most months. 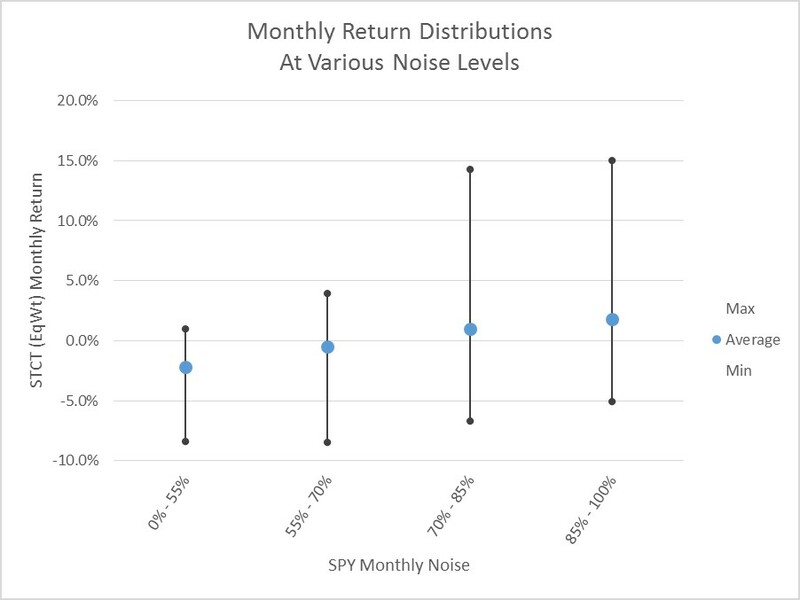 The distribution of noise indicates that it’s extremely rare to see less than 30% noise, and also that it’s common to have 90% or higher noise in any given month for the S&P 500. Even though noise can be quite unpredictable from one month to the next, it’s also interesting to note the long-term trend of increasing noise in equity markets over the past half century. 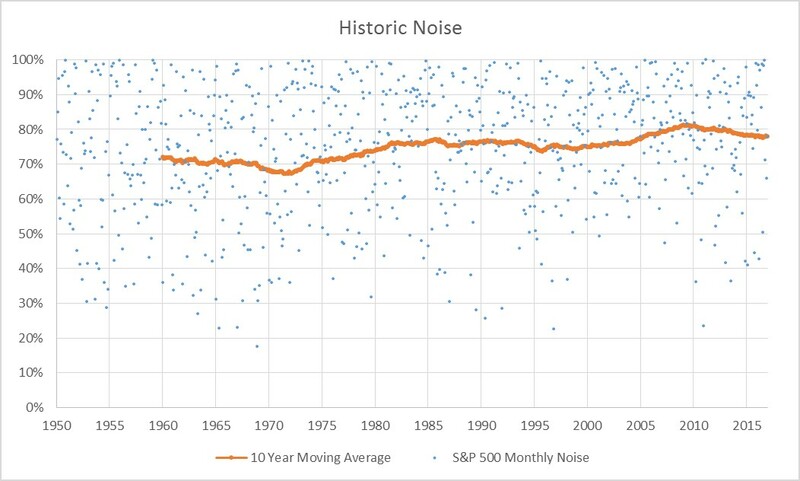 By looking at the 10 year moving average of monthly noise, it’s clear to see that the S&P 500 has been becoming steadily noisier since the 1950s. Back in the 1950s, 1960s, & 1970s, the average noise was roughly 70%. A significant shift occurred throughout the 1980s that resulted in much higher noise values, and now the average is much closer to 80%. Based on these changing trends, it’s important to consider whether more weight should be placed on the backtested performance of counter-trend trading models during the recent decades of higher noise regimes. Since the rise in noise over the past few decades is likely due to a number of systematic and behavioral factors that stem from increased access for retail (uneducated) investors to quickly and easily place trades based on emotional biases, it’s reasonable to assume that this level of noise is part of a structural shift and will remain high for the foreseeable future. Also, since the SPY ETF was introduced in the early 90’s and the ability to trade inverse S&P 500 ETFs have only come available more recently, there is more reason to put emphasis on backtesting during the recent periods starting either in the 90’s or the 00’s. These extensive descriptions on noise and volatility may seem like overkill, but they are critical to address before diving into the exciting details of how short-term counter-trend strategies perform in various market environments characterized by noise and volatility. Since noise can basically be equated to the opportunity set for counter-trend, and volatility is the amplification of the returns for the most part, investors can expect the best returns from a counter-trend trading strategy during market environments with high noise and high volatility. For reference, the selected breakpoints for characterizing ‘high’ and ‘low’ noise and volatility were determined based on the distributions of noise and volatility for SPY since 1993, and are 80% and 20%, respectively. The 80% threshold for noise was described in previous paragraphs and supported by the previous chart with S&P monthly noise since 1950. The 20% volatility threshold is a bit more arbitrary, but it stems from both my calculation of the annualized standard deviation of daily prices for SPY since inception (19.0%) and the generally accepted average volatility for the S&P 500 is somewhere in the high teens or around 20%. The calculated volatility for the S&P can vary widely between 15% and 22%, depending on which interval (monthly returns, weekly returns, daily returns, etc.) and which time period is selected, so 20% is a reasonable selection for the volatility threshold. As a side note, my selection of these 80%/20% thresholds are a confirmation of those used in the analysis of the 361 Capital white paper titled Counter-Trend Trading written by Nick Libertini in 2012. 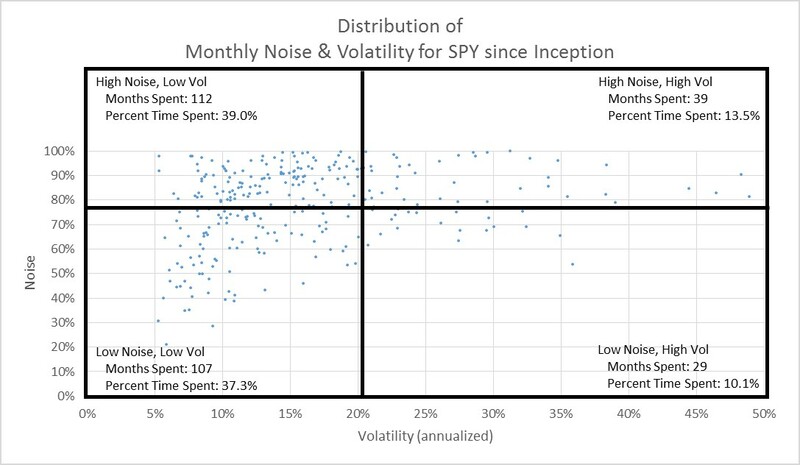 Since SPY rarely spends its time with annualized volatility above 20%, the best market environments that are characterized by high noise and high volatility have historically only occurred roughly 13% of the time. On a related note, the other high volatility environments with low noise have the potential to be the worst environments, which have also only occurred about 10% of the time. 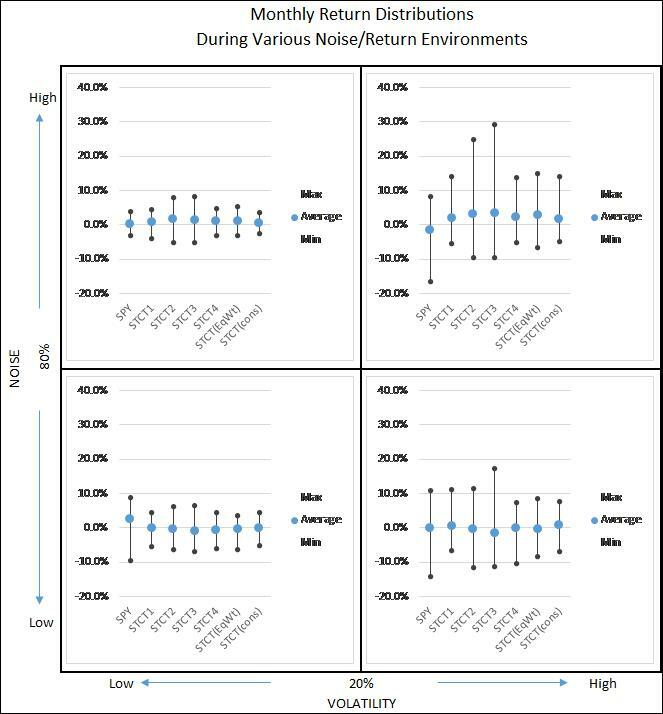 The two other environments that combine low volatility with varying noise levels occur the vast majority of the time and often result in more muted return profiles. 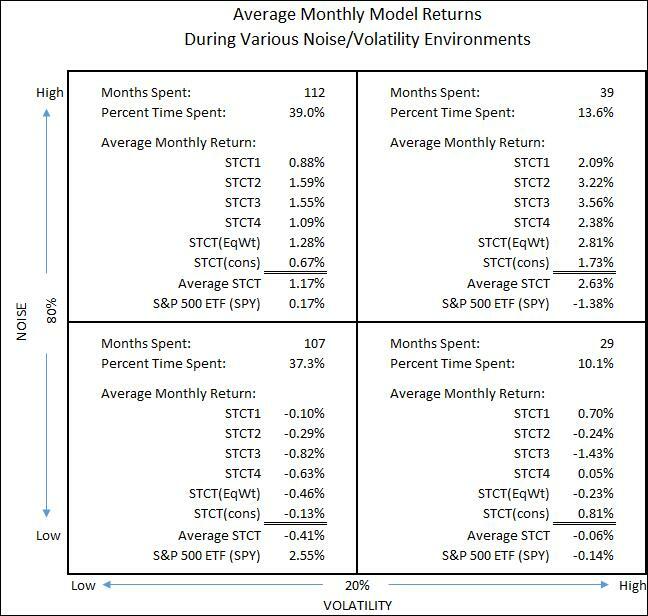 The following chart shows the average monthly returns for each strategy during each of the four noise/volatility environments. It’s pretty clear from the previous matrix of average returns that counter-trend strategies tend to thrive during high noise environments, and that volatility has the ability to amplify those returns during high noise environments; however, that chart doesn’t show clearly how high volatility affects returns particularly during low noise environments. Instead of just looking at the average monthly return for each of the four quadrants, it’s also important to consider the distribution of those returns to fully understand how these strategies can be expected to perform during the various environments. 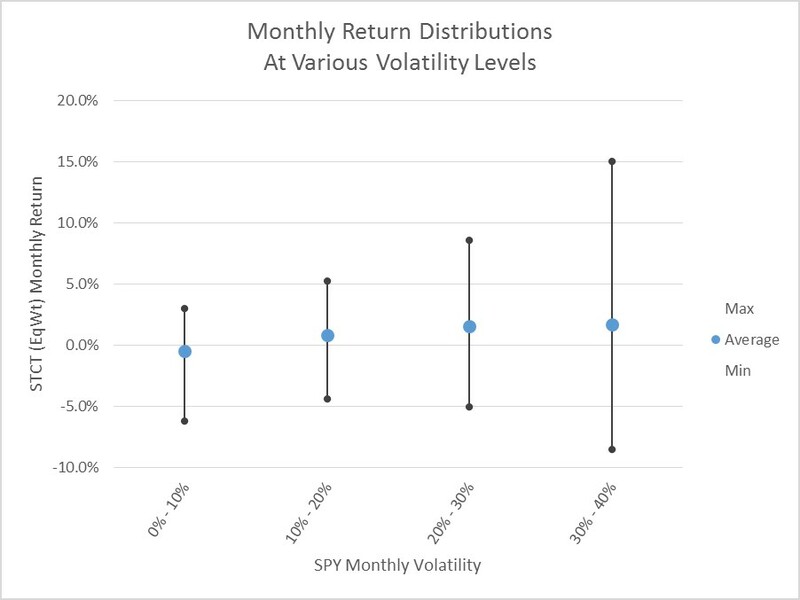 The following graph of monthly return distributions for each environment show how much the maximum and minimum returns can vary significantly based on the level of noise and volatility. Pay particular attention to how the upper and lower extreme returns for each strategy expand significantly as volatility increases. Short-term counter-trend strategies are great for pairing with exposure to trend-following within investor portfolios. The structures of the two strategies are parallel in many ways, ultimately making short-term counter-trend easier to add to a portfolio if the investor is already familiar with the structure and comfortable with the merits of a similar strategy that involves quantitatively driven trading models. Furthermore, they tend to act as great compliments for each other, since they are uncorrelated to each other, due to such differing trade signal lookback periods, trade hold periods, hit ratios, number of trades, and size of winning/losing trades. The amount of noise in markets has been seen to be the primary determinant of short-term counter-trend returns, and volatility generally has the effect of amplifying the risk around the strategy’s returns. Although investors don’t have a crystal ball to see what future environments will play out for the markets to determine whether next month will be a great month for short-tern counter-trend, investors can at least have a relatively good understanding of how the strategy is capable of performing at its best and at its worst, so that he/she will be able to stick with the strategy when that inevitable string of large losing trades occur. If you’ve read both this blog entry and my previous one about short-term counter-trend investing, I really appreciate the time you’ve spent reading my research. Hopefully you’ve learned a thing or two about short-term counter-trend trading strategies or at least found this to be a nice refresher for stuff you already knew. Either way, you’re in a good position to consider whether adding an allocation to counter-trend within your portfolio would be a good idea. Depending on your unique investing goals and the risk you are capable of taking in your portfolio, it may be appropriate to add a small to moderate allocation, but that consideration also hinges on how you might implement it within your portfolio. There are various ways you can get exposure, each requiring decisions about how much risk and how much of your time you are willing to spend. I’ll go into implementation in much more detail in my next post, the final blog post of this mini-series on short-term counter-trend. As with trend-following, investors reference counter-trend strategies by many variations and spellings of the “counter-trend” name. For instance, it can be called a countertrend strategy, counter-trend trading, a price reversion strategy, or sometimes referenced as a swing-trading strategy. In many instances, it is also referenced specifically as a short-term counter-trend strategy, abbreviated “STCT,” because of its short-term nature. Even though counter-trend is one of the three distinct strategies within the overarching category of managed futures strategies (which includes trend-following, counter-trend, and relative value), counter-trend is seldom referred to by the name “managed futures,” whereas the terms “trend-following” and “managed futures” are often used interchangeably.